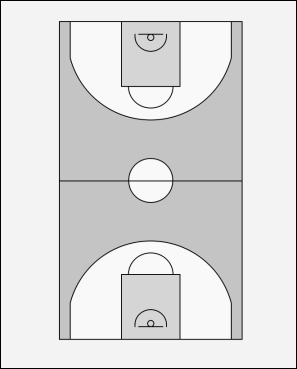 Players 2 and 3 pass the ball back and forth till the half court line, whilst players 1 and 4 sprint the lanes. After 2 catches the ball at the halfway line, a pass is made to 4 for a lay up. 1 swings through underneath the basket. 3 rebounds the ball and makes a pass to 2 who passes to 4 (who has swung through after making the lay up). 4 then makes a long pass to 1 for a lay up. • Sprint the lanes wide and fast.